Managers today are under a lot of pressure. The bar keeps being raised. They are responsible for more and more employees. More of the people they manage are working in areas of expertise that the manager doesn’t know much about, or maybe knows almost nothing about. Managing people is getting harder, and it can be tempting for managers to try and find a “quick fix” solution that will solve all their management problems… at least for a little while. The latest trend in management or leadership can seem to improve things at the beginning. But very quickly it becomes clear that the system isn’t sustainable, or that it was merely improving things on the surface without addressing the core issues the manager faces. Think of it like a fad diet: it may cause you to lose a lot of weight initially, but it doesn’t necessarily make you any healthier, and, as soon as you stop dieting, the weight all comes back. Don’t fall for management “fad diets.” Practice the fundamentals instead. Nearly nine out of ten managers aren’t providing the guidance, direction, support, and coaching their teams need to be successful. Undermanagement is the root cause of so many ongoing management challenges and problems. 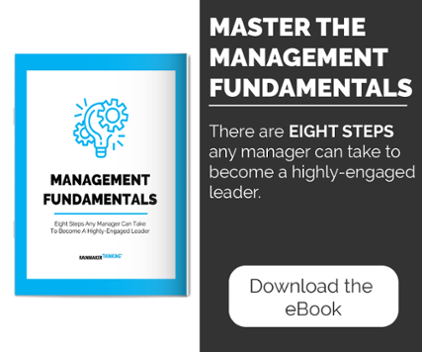 The solution is simple, but effective: a rigorous adherence to the fundamentals of highly-engaged management. If a management “quick fix” solution is like a fad diet, then think of the management fundamentals like taking a walk every day and eating your vegetables. Adopting a routine system for maintaining the quality and productivity of your team may take some time, but eventually that daily effort really adds up. When managers practice the fundamentals, they create an upward spiral of performance driven by structured, ongoing dialogue. The power of the management fundamentals in action. The spiral can only gain momentum if the fundamentals become habit, both for managers and their employees. But high-structure, high-substance communication is a powerful framework that prevents so many small problems from becoming large, production-halting problems in the future. Consider this example from one of our clients in a medical clinic. The answer? When the manager didn’t spell it out for Chris, he got it wrong. So, yes! Spell it out for him, every day if necessary, until his performance starts to improve. Turn that big pile of mail on his desk into a project. Give him a clear deadline. Break it down into smaller goals, with precise instructions. Don’t wait to start an upward spiral of performance on your team. Imagine the impact it would have if you started running one mile every day, for the rest of the year. Now imagine the impact that practicing the fundamentals of management, a little bit every day, would have on the success of your team. Don’t wait until there’s a crisis to start managing! Start now and build the habit, so that when there really is a management challenge you have to deal with, you are in a much better position to handle it quickly.